Once in awhile a dog passes away while still in foster care before adoption. This can happen during their initial vetting because of an unknown health issue or because we receive an injured or very sick dog that isn't able to pull through inspite of our best efforts. It could be as the result of a mistake such as a foster that accidentally gets loose and gets hit by a car or eats something it shouldn't. Sometimes these dogs are returns from owners and some have never had a home. Each one is loved by their foster family and the people that come into contact with them. 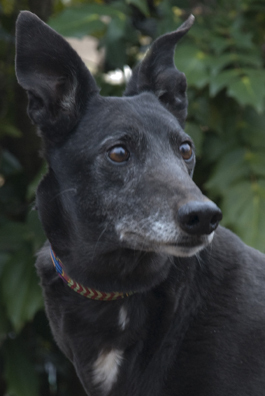 We offer foster homes and our volunteers the opportunity to do a memorial adoption of these fosters so that all of our greyhounds end up with a family in the end. Prudence just arrived from the Birmingham Track Adoption Kennel. She actually retired from Daytona Beach in Florida in Nov but was sent to Birmingham for transport to adoption groups around the country. She also raced at Palm Beach and Valley Race Park in Texas. Prudence wasn't a great racer but she did win some of her 80 races and placed in a lot too. She is a smart girl that quickly figured out how to take off her muzzle before a race and comments on her races often say "no muzzle" or "muzzle in mouth". She is a little girl that raced at 58lbs. Prudence turned 3 on June 23rd. Her sire is Chasin the Richs and her dam is Turbo Paula. 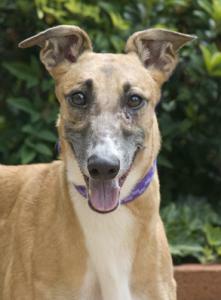 Prudence is a very friendly, happy girl with ears that stick straight up when she is curious about something. She did not pass her initial cat test. Her foster family is working with getting her used to their cats and after a few days started doing better with them but still has a pretty high prey drive and has to be watched very closely around them. She likes other dogs and children. 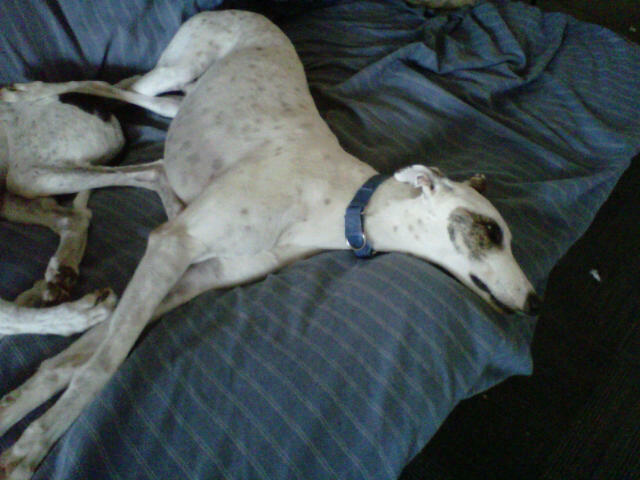 She is a natural sitter, most adult greyhounds aren't very comfortable in that position. Prudence has adjusted fast to home life. We lost Prudence shortly after her spay from a pulmonary embolism. RIP sweet girl! On Vet Hold! 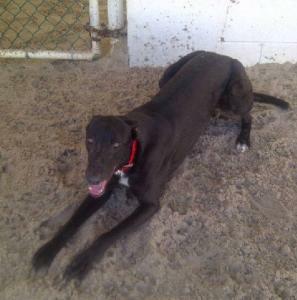 Axe is a big, friendly, black male that raced at 79lbs. He will turn 8 on December 22nd but you would never guess his age because he has not gotten white in the face yet like most other dogs his age. 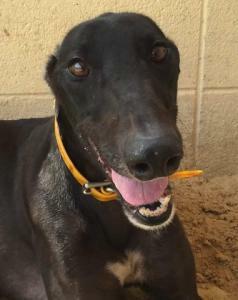 Axe was quite the star during his racing days, racing at 3 of the top tracks in the country and winning at the top A and AA levels and competing in Stakes races reserved for the best dogs at those tracks. He only raced 41 races and retired in April of 2013 due to a broken hock. The leg is long healed and he runs and plays normally on it. Axe has been hanging out at his owners farm since he was rehabbed from his injury. Axe's sire is Odd Skill and his dam is Myokie Flame. His half brother from the same mom, Rico's Kwanza, came in at the same time. We already placed two half sisters that also had the same mom, Rico's Tignanello and Rico's By A Nose. Axe was very interested in the cat when he first met it, but after the cat slapped him a few times he didn't want to go near it again. We think he would probably be able to live with a confident cat that would slap him if he showed too much interest the first time they met. 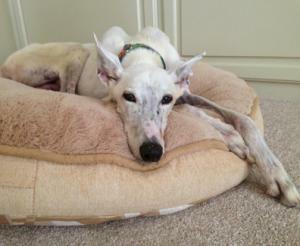 Axe has been living in a foster home with a small white dog and has done fine with him. Axe is very vocal and barks constantly if awake and seems almost frantic. He drinks constantly and then has to pee all the time another sign of stress. We have had two greyhound vets board him for extended amounts of time and do testing on him in hopes we can find a physical cause. They have tried medications to calm him down. So far none of their testing has shown a physical cause for his behaviors and the medications to calm him have had no effect. When Axe was neutered our vet did find a tumor in one testicle that was removed. Surgery is curative for most testicular tumors but it is possible that the tumor could have spread to his brain which might explain his odd, frantic, behavior. Axe has been under vet supervision for weeks already and is still on vet hold until we know more. Sadly Axe continued to progress quickly. Our vets felt that it was a brain tumor that was causing all his physical problems and recommended that we let him go. RIP big guy! One of his foster homes, the Owens family, decided to do a memorial adoption for him. 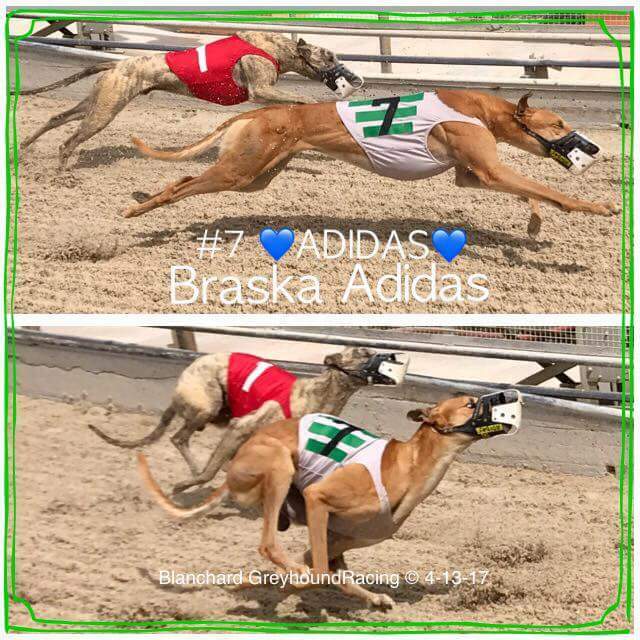 Adidas just arrived from Jade Feise kennel at Naples Ft Myers Race Track. He also raced at Flagler, and Orange Park. He raced 52 races and got up to the top A level and even won one Stakes Race for the fastest dogs at the track. He raced his last race on April 18th. Adidas is a large red fawn male that raced at 80lbs. His sire is Braska Baxter and his dam is Braska Daffy. He will turn 3 on September 2nd. More as we get to know him. Shortly after Adidas arrived with us he became very gravely ill. The Emergency Vet was unable to save him and he passed away. A memorial adoption has been requested by Ann Owens, Denise Dyer, and Amanda Crago who were with him during the last day. Our condolences to them and the trainers who cared for him in Florida. 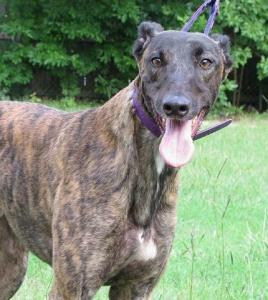 Blue is a 62lb, red brindle, female that just arrived from the Birmingham Race Track. She raced 48 races there and got up to the B level. She broke her leg in her last race on April 22nd. 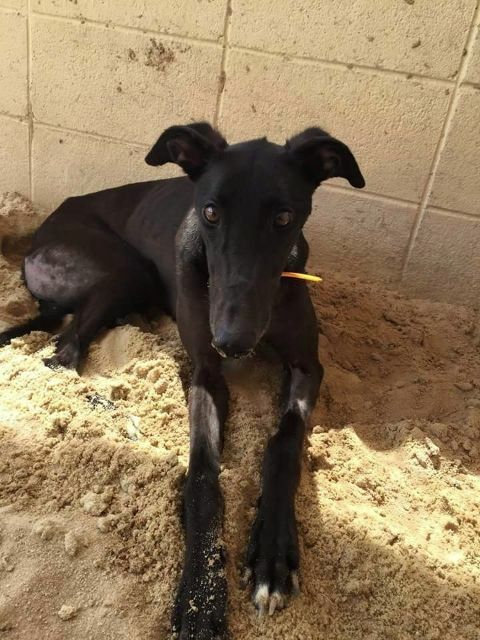 She had her leg fixed at the track and she was sent to Pro Greyhound to compete her rehab. 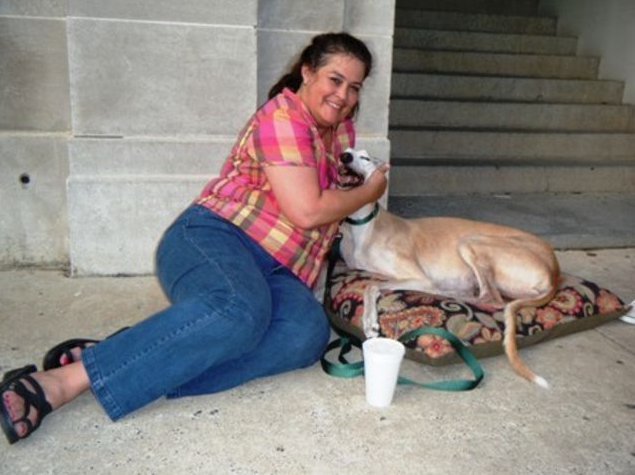 Pro Greyhound is a 501C3 group that does surgeries and rehab on injured greyhounds with the help of your donations. She turned 2 on April 13th and her sire is the famous Lonesome Cry and her dam is Flying Moonlite. She is a very outgoing girl that loves people. She is quiet in her crate and passed her small dog test easily. Blue's leg was healing up very well but she started acting like she didn't feel well. Her vets checked her and weren't able to find anything wrong initially but started her on antibiotics just to be safe. She continued to go downhill and seemed to be in pain. More testing was done and specialists were contacted. By the time they found what looked to be cancer in her abdomen, she was barely able to walk. She was in a lot of pain, so the decision was made to help her cross the bridge since nothing could be done. RIP sweet girl 11/4/17. Passion just arrived from the Daytona Beach Race Track. She only raced a few of her 81 races there. She also raced at Flagler, Naples-Ft. Myers, Mardi Gras and Southland. She turned 4 on January 24th and weighs 64lbs. Her sire is Rhythmless and her dam is SE's Goin Skiddn. She is very calm and sweet and doing great in foster care with 5 other dogs of other breeds. She travels very well and just laid down and went to sleep on the trip up. She rolls over for belly rubs and seems like a very friendly girl that likes people. She will snuggle up with the other dogs in her foster home on dog beds but she prefers to lay on the couch. Very sweet, cute girl! Sadly Passion stopped breathing while in recovery from her spay on 6/29/16. She was unable to be revived. Rest in Peace Little Girl. She was adopted in memorial by her foster foster family the Harris Family. 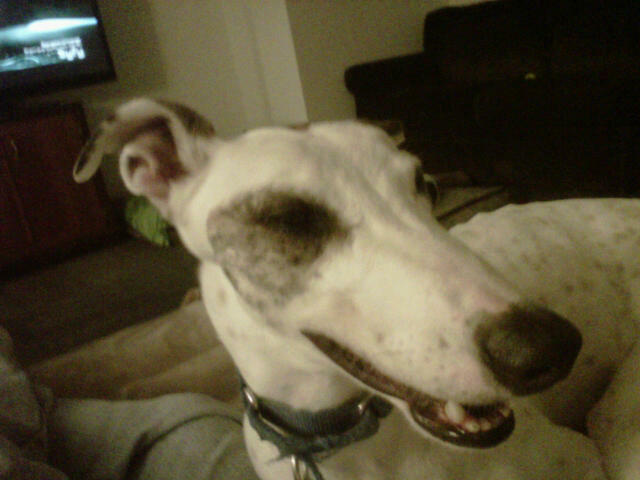 Tommy is a small 65lb white and black male greyhound that raced 74 races before he retired. He raced at JCKC near Tallahassee Florida which is a lower end track but he was a top level racer there staying at A level for a long time. He also raced at Sarasota and Naples Ft Myers. His last race was June 24th 2009. He was born on July 1st 2006. His sire is Tnt Star Wars and his dam is Copperkettle Pat. Tommy seems to be a confident little guy that is pretty friendly. Tommy was placed in an adoptive home but was returned to us and passed away while in foster care. 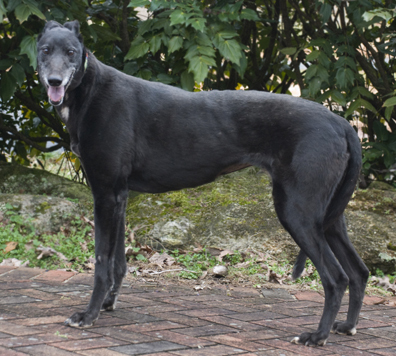 Drill is an older, black, female, greyhound that only raced 4 races that we could find 3 at Tri-State and 1 at Pensacola. Even though she wasn't a great racer, she was retired to be a brood mom because she is a sister to a famous stud dog Ebony River. She had a litter of 5 pups in 2008 but those are the only ones we found. She has been living on the brood farm since then. Drill raced at 61lbs and will turn 11 on July 7th. Because she is an older girl she qualifies for our reduced adoption fee of $200. Her sire is DK's Prime Time and her dam is Turbo Chopper. Drill was just a little overwhelmed the move to a home, but only just at first. She warms up fast and was trying to get the other dogs in her foster home to play with her right away. 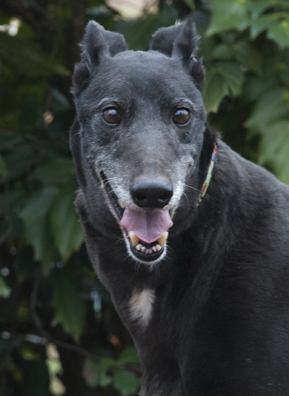 She is very playful for an older girl and is very sweet and loving. Drill gives kisses naturally and learned to give kisses to get treats too. 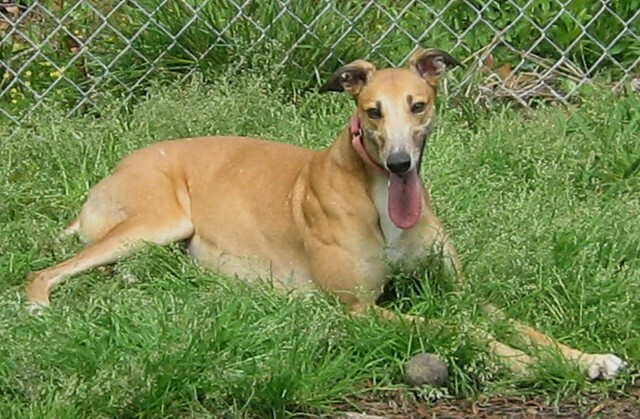 She gets along well with the other greyhounds in her foster home and runs in the yard with them. She is being fostered with cats and was in a home with small dogs for a short time and does very well with both. Because she is an older girl she qualifies for our reduced adoption fee of $200. Update 4/6/16 Drill broke her femur near the hip this morning when she went out to potty. She is sedated and has had Xrays that are being sent to a specialist for a second opinion. Update 4/7/16 Drill was diagnosed with osteosarcoma - bone cancer which caused the spontaneous fracture. There is no cure or treatment and the bone will not heal so we had to help her cross the bridge. Her foster family wanted to adopt her and will do a memorial adoption so she will be home forever. Eyelet just arrived from a farm in Kansas. She was a good racer that raced at Derby Lane, Wheeling, Flagler and Naples Ft Myers tracks. She raced 75 races many at the top A level. She also competed in some Stakes races. After her successful race career she was sent to the farm to be a mom. She has two litters of pups listed. Now she is retired from being a mom and is ready for a couch. 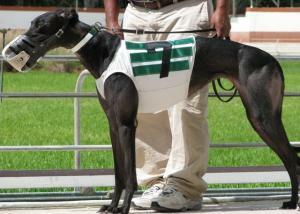 Eyelet raced at 57lbs and turned 7 on July 11th. Her sire is the very famous Flying Penske and her dam is Flying Buttons. Eyelet seems like a calm sweet girl that travels well. More as we get to know her. 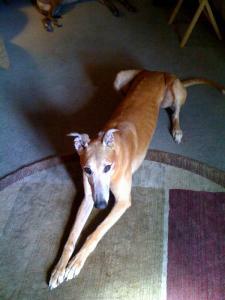 We lost Eyelet shortly after her spay surgery to a bleeding disorder that we see in a lot of greyhounds. She had been treated with Amicar which usually prevents bleeding but even that wasn't able to save her. 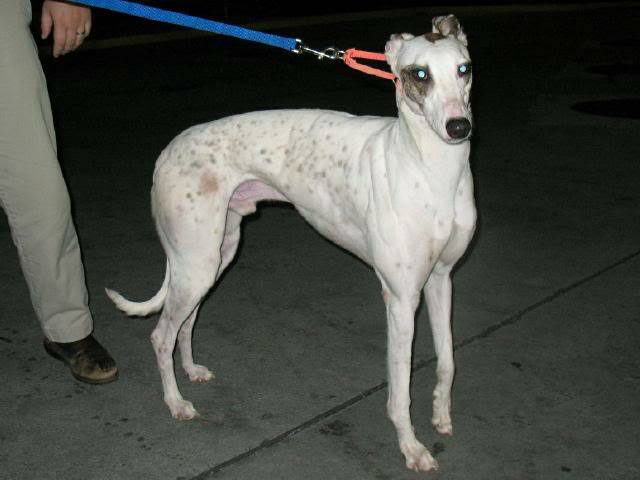 Moheni just arrived with a group of dogs from Southland in Arkansas. She raced 223 races. A few races were at Derby Lane but most were at Daytona Beach Track, she never actually raced at Southland. She mainly raced at the lower levels but was consistent enough winning the lower level races to keep racing until she was nearly 5. Moheni turned 5 on July 13th. Her sire is Em's Mac Attack and her dam is Voo Doo Von Bones. Shw raced at 60lbs. Moheny is very sweet and seems pretty laid back. She has been overwhelmed and is nervous in new situations. She loves people and gives sweet little hugs by wrapping her head or body around your legs though. She can be a little standoffish in a crowd of people she doesn't know, but is friendly with most people one on one, especially after she has met them once. She makes great eye contact and will just stare up at you with the sweetest expression. She has big white stockings and a darker face. A real beauty! Moheni needs work on leash. She is strong and is nervous so tends to pull and zig zag, if something new scares her. She did pass her cat and small dog tests with just some curious sniffing. Sadly Moheni died the night following her spay surgery of unexplained internal bleeding according to the necropsy. ON VET HOLD! 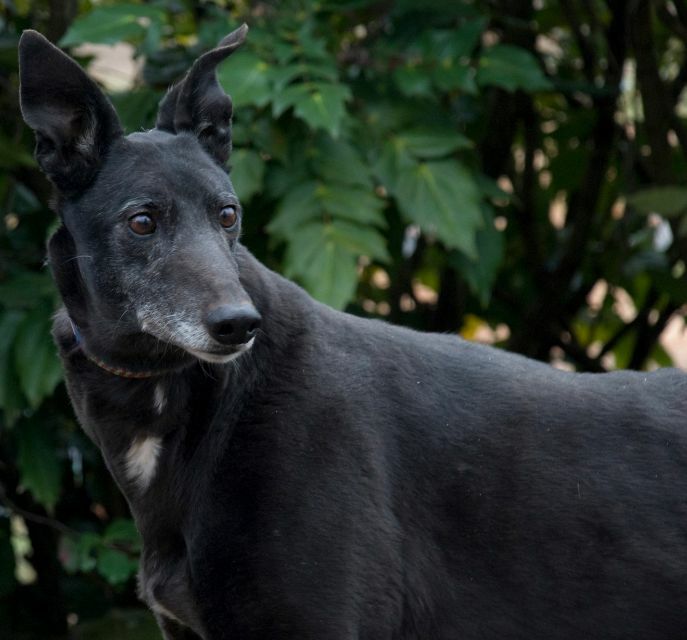 Zola retired from racing at the Birmingham Race Track at the end of March 2015 after racing 78 races. She turned 3 on June 1st. She was a good racer and her last race was at the top A level. She must have already getting sick in her last race because she trailed pretty far back and was retired. Shortly after arriving at the track adoption kennel, the workers came in one morning to find Zola completely paralyzed on the back end. The vet wasn't sure what caused it and treated her for tick paralysis at first, then decided it might be FCE and treated her for that. She recovered really well after a week or two on prednisone (a steroid) and was running and hopping around. She was still unstable on her back end and looked like she might be a little drunk because her back end would get away from her sometimes. 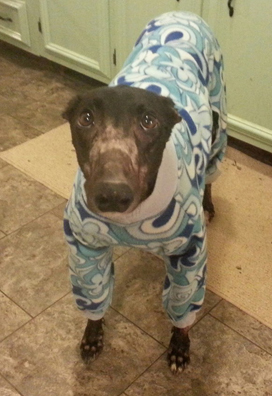 She was transported from the track adoption kennel to Pro Greyhound , a greyhound rehab organization, that takes special cases and gets them the treatment they need. Zola took a turn for the worse and her paralysis returned, when our vet tried to slowly wean her off the prednisone. She had an MRI and a spinal tap and inflammation was found in her spinal cord and she was referred to a neurologist. Her diagnosis is Granulomatous Mengingoencephalitis (GME) The prednisone that keeps her from being totally paralyzed has bad side effects. The neurologist has tried her on chemo drugs in hopes those would help wean her of the prednisone, without any luck. She can't stay on this dose of prednisone and live. The prednisone has caused her to have thin skin and patchy hair, her abdomen is very distended. She has to wear coats and boots to protect her because just laying down or bumping into something will tear her fragile skin. The drug also causes muscle wasting so her body has no muscle and she looks like a very old dog. The picture below was taken when she first got sick, before the prednisone had affected her skin and body so much. In her "other photos" the picture of her in her jammies is what she currently looks like. Zola requires about twice as much food as she should and is still thin with a big pot belly because of the medication. Help is needed for Zola's very high medical expenses that are around $5,000 at this point. 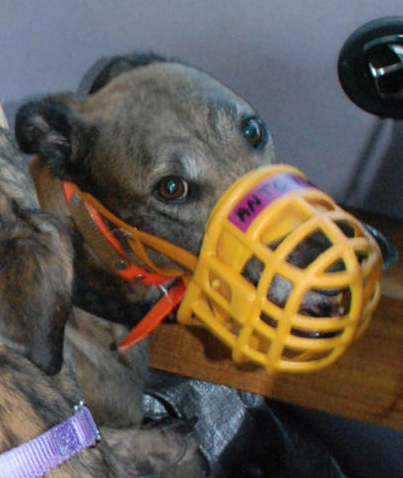 Please contact Pro Greyhound, to make a donation if you can. Zola has stayed happy during her treatment and doesn't seem to be too stressed by anything. Even when she was totally paralyzed she loved the extra attention and never struggled or seemed freaked out by not being able to move. She will figure out how to get what she wants and go where she wants no matter how hard it is. She is very smart and has figured out how to open doors and gates. Zola is currently on medical hold and is not available for adoption because she does not have a good prognosis. Zola has been fighting this since April and her foster dad is trying to keep her quality of life as high as he can for as long as he can. Zola's sire is Red Rooster Bonz and her dam is PK's Abbey. UPDATE-- We're sad to report that beautiful Zola survived in foster care for a year until March of 2016. She continued to go downhill in spite of the best efforts of Carl Doby and Pro Greyhound and our vets and specialists she was referred to. She is now part of his pack forever, and we share in the loss as he eased her across the Bridge. 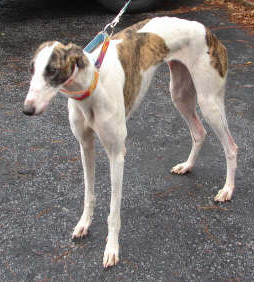 Champ originally raced at Wheeling Downs, Tampa and then Derby Lane in Florida. He was pretty good getting up to A level in his 68 races. He retired in March of 2008 and was originally placed by another adoption group in the area. His family was unable to keep him because they had a baby. Champ was very stressed by the new baby crying. 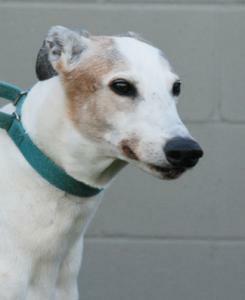 Champ is an older guy that just turned 10 on October 9th so qualifies for a reduced adoption fee of $200. His former family has kept him up to date on all his shots and vetting. 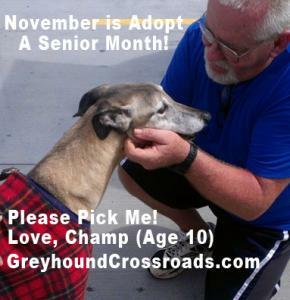 Champ is a sweet guy that is very good in the house and is very laid back. He does still play sometimes but for the most part he is a couch potato. His foster dad says he is a joy to have around and is so sweet and loving. He is very friendly and will stand next to you as long as you will pet him. He is quiet but does bark sometimes when the doorbell rings so probably wouldn't be a good apartment dog. 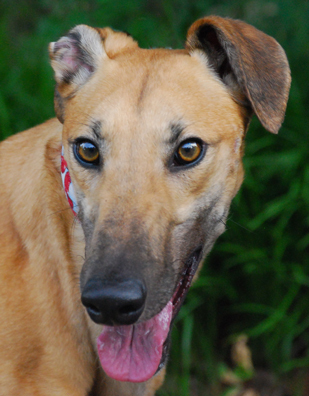 Champ has been excellent with the other greyhounds in his foster home. He did react poorly to a small dog in a previous home once in awhile so would do better in a home with other large dogs only. His sire is the famous Gable Dodge and his dam is Darragh. His littermate, Afleet Alex, is a very famous dog that was an All America winner in 2007 and now is a very famous stud dog. Champ suddenly got sick while in foster care. He was rushed to our vet who diagnosed him with advanced cancer. There was nothing that could be done to fix his pain other than help him cross the bridge. He was adopted by his foster dad in memorial. 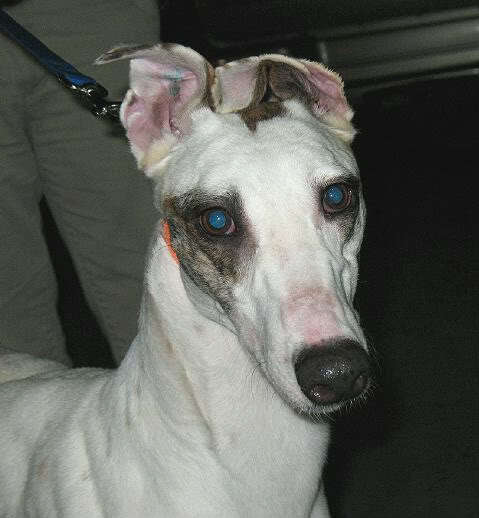 Alma is arriving soon from D'Arcy Kennels at Derby Lane in Florida. She only raced 3 races and showed some promise but had a minor injury so they decided to retire her. She is fine now and has nothing noticeable for a pet but she probably wouldn't be a good choice for someone that wanted to lure course or do agility. She turns 2 on July 20th and raced at 63lbs. Alma's sire is Crash and her dam is Celtic Dream. Her trainer says she is still very playful and puppyish since she is so young. She is good and quiet in her kennel but loves to run around. Sadly we lost Alma to a bleeding disorder brought on by her spay surgery July 22nd 2014. 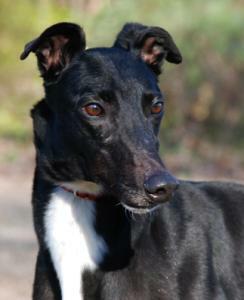 Powell is a stunning black male that raced a long time at Tri State in WV and in Birmingham Alabama. 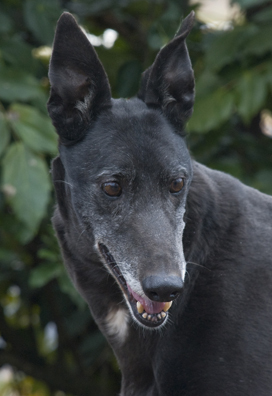 He has an amazing 231 races listed probably more than any of the dogs we have placed. It is rare for a dog to race after 5 years old but Powell did. According to the folks that have worked with him, he is calm, quiet and well behaved and would be a good dog for an apartment or townhouse. Powell's sire is the famous Trent Lee which makes him a half brother to Ricky. His dam is Its My Fancy. He raced at 71lbs so he is a smaller guy. He will turn 6 on Jun 7th. Powell did not pass his cat test so needs a home without cats. He liked the kids he met. Update: Sadly, Powell was lost during his vetting and all attempts to revive him were unsuccessful. He is being adopted in Memorial by his foster home Robin Frymire. He was a terrific boy and will always be a part of the GC family. 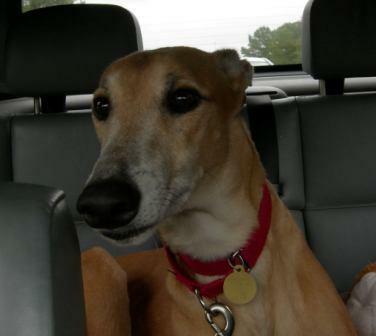 Sadly, Geronimo was returned to Greyhounds as Pets/NE Florida on the day we visited their excellent facility. He had been adopted many years before, but his owner had just passed away unexpectedly. Our volunteers fell in love with him immediately and asked for the chance to give him a home through our group. When he arrived at our clinic for vetting, it was found that he had advanced tumors making it impossible for us to do anything more than help him ease gently across the Bridge. He was a GC baby, if only for a few hours, and is once again reunited with his owner of so many years. Huge thanks to Dr. Paula Watkins and the staff of Chinquapin Animal Hospital, and to Denise Dyer and Janet Pruitt who brought him from FL to SC. They will be completing a Memorial Adoption for this beautiful soul who touched all of us. Andy is a large nearly one year old pup that is coming to us straight from a farm in Florida. He suffered a bad leg break while playing on the farm and is having to have the leg amputated in Florida before he can be transported to our group. He will be on hold for a couple of weeks while his incision heals and he recoups from his amputation. His surgery was 11/5/13. Andy is a gorgeous red brindle with a white blaze, chest and white feet and even a white strip around his neck. A really striking handsome boy. We adopted out one of his brothers as a puppy after a similar injury and he is already a very big guy. The pups turn 1 year old on Nov 16th. Andy never raced and hadn't even started race training and was injured playing in his run. His sire is FlupasCrackerbox and we placed his dam FF Boots already. 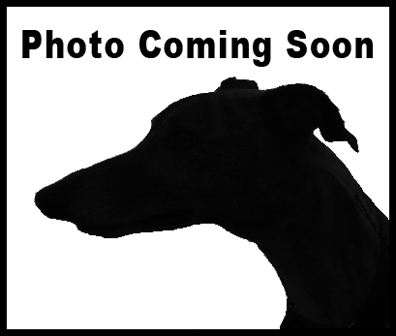 If you would like to make a donation in his honor to help other injured greyhounds get the surgery they need please go to our Wounded Athlete Fund page. Sadly we lost Andy a day after his amputation surgery to a blood clot before he was transported to our group. 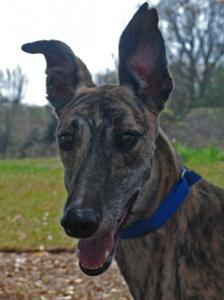 Cobalt is a friendly, dark brindle male with a black face. He raced at 71lbs and just celebrated his 2nd birthday on May 21st. His sire is Fuzzy's Cannon and his Dam is Greys Redington. He just retired from Sanford Orlando Race Track but also raced some of his 36 races at Sarasota. He won just one race but he did place some. His trainer said he was calm and well behaved at the track. He was a quiet boy that never caused any trouble. Just a very nice guy. His trainer felt he would be good for a first time foster home that we needed a dog for. He passed his cat test at the track and is living in a foster home with a cat. His foster home says he has been great and is indeed a well behaved guy. He potties on a leash and is doing well with their male greyhound. He is quiet in his kennel and is living in a townhouse so might be perfect for townhouse or apartment living. Unfortunately Cobalt was sick when he came to us with a tick disease which quickly got worse with the stress of the move and his neuter. By the time we realized he was sick he was already in a crisis situation and was bleeding internally. Sadly the expert care he received from several vets was not enough to correct his issues, and he Crossed the Bridge on 7.9.13. Our condolences go out to everyone that knew him prior to adoption, as well as the volunteers of GC and the staff of Chinquapin Animal Hospital. We are thankful for the excellent care you gave him during the short fight. He was the first foster for Shannon and Erin Haynes of Greenville, SC, who will be doing a Memorial Adoption right away so that he will always have a home and loving family. RIP Cobalt, we grew to love you very quickly and wish you had more time to enjoy retirement with us. 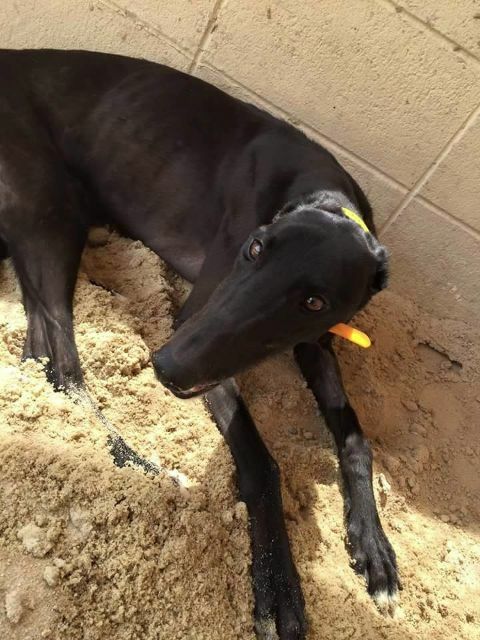 Michele is a small black 57lb female that just arrived from the track in Orlando. Her birthday is March 28th 2010 so she just turned 2. Her trainer said she is a friendly, sweet girl. Michele passed her cat test at the track. Her sire is Tony's Oracle. She is a littermate to Nancy G Gracie and Cute Candle that arrived from the track together. Michele's new family met her and fell in love with her shortly after she arrived from the track. Sadly Michele passed away during her spay surgery a couple of days later and never actually made it to her new home. 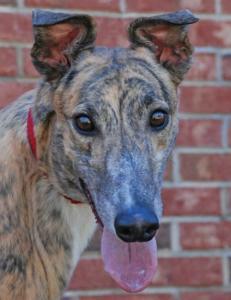 Steel is a brindle male that is a littermate to another sweet boy that we recently adopted out named McCoy. His birthday is July 1 2008 and he raced at 72lbs so he is a medium sized guy. He has cute stand up ears and he is very alert and curious but pretty calm and not that energetic. 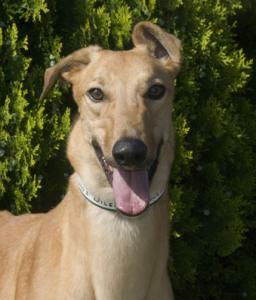 He is friendly and wags his tail low when he meets other dogs and even cats. A very cute submissive gesture that says he just wants to be friends with everyone. He is even doing good with the birds in his foster home! At the track he was a calm, well behaved boy that liked his trainers and followed them around when they did their chores. He passed his cat and small dog tests so should be fine living with either. So far Steel has crated well and has been very quiet in his crate. He sleeps though the night and is learning steps. He walks good on leash already. He loves people and other dogs but can be pretty timid around new things and scary loud noises. Car rides make him nervous too. Steel seems like the type of guy that will probably enjoy being more of a homebody and staying in familiar surroundings. He seems to be a bit braver in new situations it he is with other dogs rather than being alone. Steel suddenly got very sick and was rushed to the vet a week ago Friday for emergency surgery. Even with surgery and the best medicine has to offer he is not doing well. We are hoping he can hold on long enough for biopsy and blood results to come back from the lab but it is minute by minute at this point because only the IVs he is on are keeping him alive. We would appreciate prayers for Steel. Update: Steel got somewhat better and was able to eat and drink just a little for a few days. Saturday and today he took a turn for the worse and crashed. We lost him April 1st 2012. RIP Steel. Bacchus wasn't a great racer but did race at a couple of different tracks. He raced his last race 7/ 2/10. His sire was the famous Flying Hydrogen and his dam was JC's Archangel. He was a young, red boy that was born on 9/3/08. He was adopted shortly after he retired by a family in Columbia SC. Sadly Bacchus was hit by a car after being allowed to run loose in his neighborhood. This is why it is strictly against our adoption policy for greyhounds to ever be allowed to run loose. His owner was unable to afford vet care for him so she relinquished him back to our group. He survived only a few days and succumbed to his extensive injuries in spite of multiple surgeries trying to save him. RIP Bacchus. Joe joe raced at the Palm Beach Race track and raced his last race on Feb 24th 2003. He raced at 71lbs and was born on 11/22/00. His sire was Bomb Threat and his dam was General Shorty. Joe Joe was initially placed by another adoption group and was in a home for years before his owners decided they couldn't keep him and relinquished him to our group at the age of eight and a half. Sadly Joe Joe got attacked by some dogs while in foster care and we weren't able to save him. He crossed the bridge due to those injuries in 2009. Rest in peace Joe Joe. 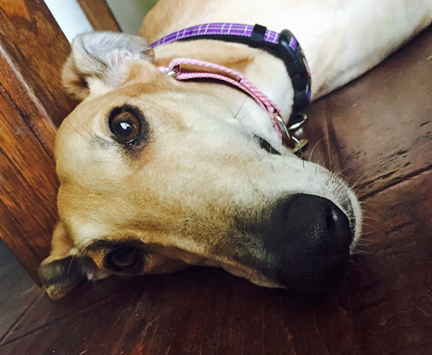 Sadly, Ale went into a sudden cardiac arrest during her vetting. All attempts to revive her failed. Becky Canfield and Ann Owens had the opportunity to know her during transport and Charlie Austin was looking forward to her arrival as a foster. Our thoughts go out to these members as well as our vetting staff who are mourning her. Ann Owens requested the honor of a memorial adoption for this little girl. Sadly, we lost Luna suddenly while she was still in foster care. She appeared to have been poisoned and we think may have eaten a rat or a mouse that had been poisoned. Her first foster placement, the Wilkins family in Bolivia, NC, has requested the honor of a Memorial Adoption. They consider her a loved and missed member of their pack. Our condolences to everyone in the GC family who knew and loved this pretty girl. A huge thank you goes out to the Ross family in Columbia who did everything possible in the emergency which cost Luna her life. None of us will ever forget her. We received Antonio from Sanford Orlando Race Track. He raced his last race on 6/27/08. Antonio was a shy but sweet brindle boy. His sire was Deuce's Wild and his dam was JNB Rock Bottom. He was a kennel favorite because he was such a timid sensitive boy. He had grown to love his trainers and had gotten very attached to them. His trainers wished they could just keep him themselves and were really worried about how he would react to the change from his track kennel to home life since he was such a timid high stress guy. Sadly, Antonio left us suddenly just hours after arriving from Florida on 7/12/08. He began hyperventilating during transport in his foster mom's van. They were stuck in traffic, so it took some time to get to a vet and he died before they could get there. 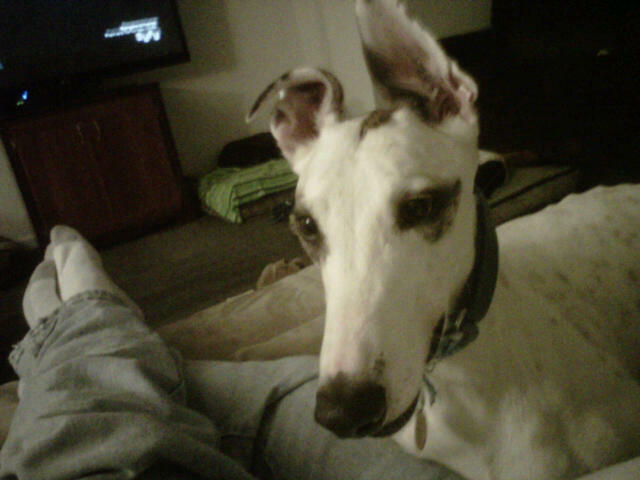 His foster family, the Small Family of Myrtle Beach, SC, have requested the honor of a Memorial Adoption. His last hour ws spent surrounded by their love. Our condolences to Cindy Small as well as Joanne Johnson and Becky Canfield who spent time with him the week-end of his death while transporting him. We also wish to send prayers to his trainers, Diane Alphonso and John Galui, who loved Antonio as a kennel favorite and wished they could have kept him forever as their special pet. It was their wish to share his love with others that let Antonio spend his last day with our group.